A bright and increasingly warm day saw passage tick over without it ever getting very busy. 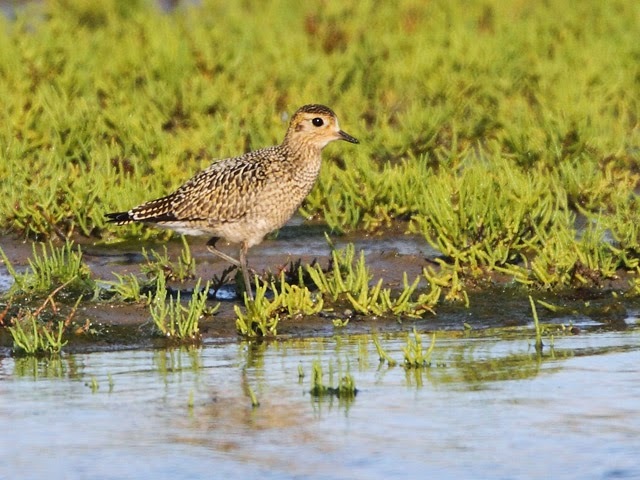 The numbers at the Bill were again overhead, with a steady movement of Yellow Wagtails and Tree Pipits for the first couple of hours after dawn being replaced by a stronger passage of hirundines as the day wore on; on the ground Wheatear, Sedge Warbler and Willow Warbler all came in with totals between 15 and 35, whilst 2 White Wagtails and the first Merlin of the autumn were the best of the rest. 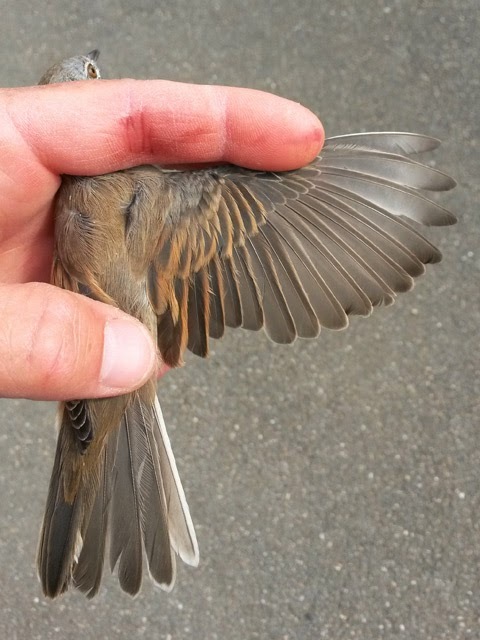 Better concentrations of several grounded migrants - including 15 Blackcaps, a species still largely missing at the Bill - were reported from the Avalanche Quarry area, whilst numbers also picked up conspicuously at Ferrybridge. 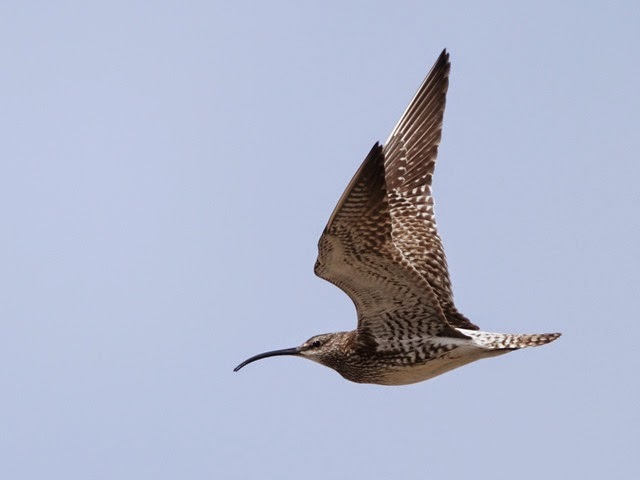 The wind had shifted too far into the north-west for the seawatchers, with just 2 Balearic Shearwaters logged at the Bill. 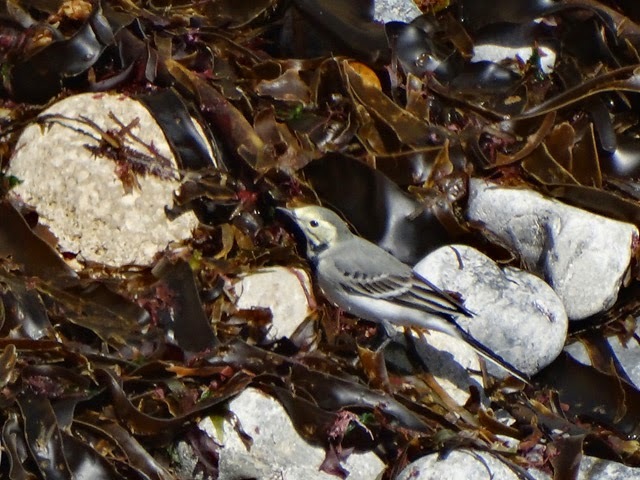 ...despite plenty of seemingly suitable north-westerlies White Wagtails have been absent until today when the first couple showed up in one of their most favoured spots on East Cliffs at the Bill. 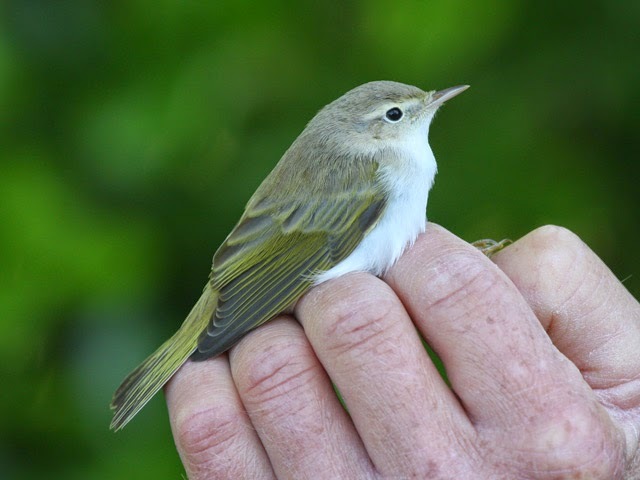 The continuing westerlies looked to have done no good on the land, where numbers on the ground were dreadful and passage overhead was hardly a spectacle, so it was a welcome surprise when the second Melodious Warbler of the month popped up out of the blue in Top Fields; routine fare included a reasonable total of 50 Yellow Wagtails at the Bill but precious little else in an quantity and certainly nothing else at all out of the ordinary. 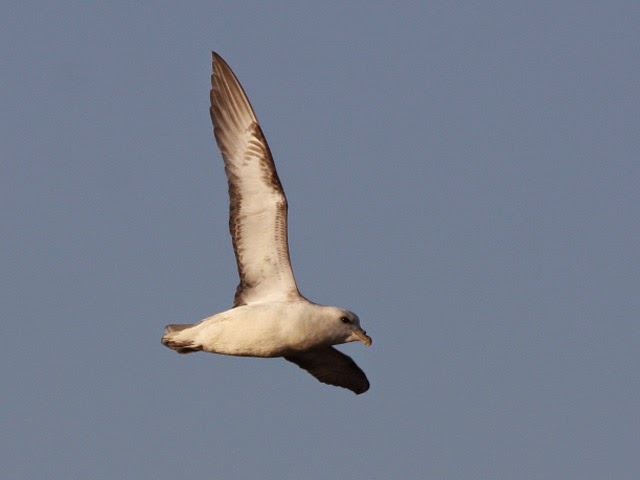 Yesterday's flurry of Balearic Shearwaters was maintained, with another 49 passing through off the Bill; 10 Manx Shearwaters and the autumn's first 2 Sooty Shearwaters were also logged there. 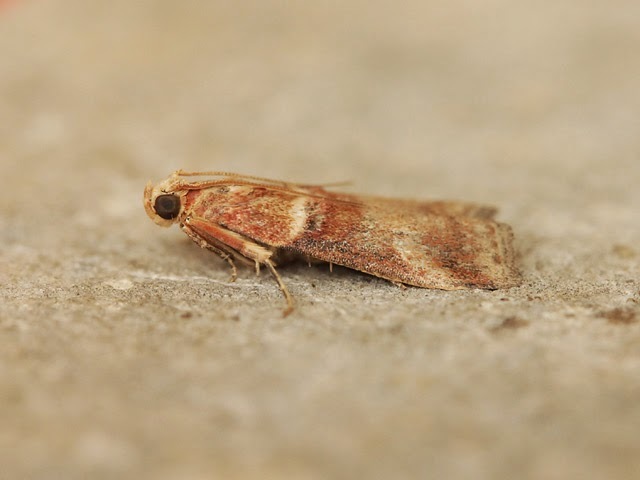 The results from overnight moth-trapping were best forgotten, with 2 Diamond-back Moth the only immigrants amongst a pitifully small catch of routine species at the Obs. 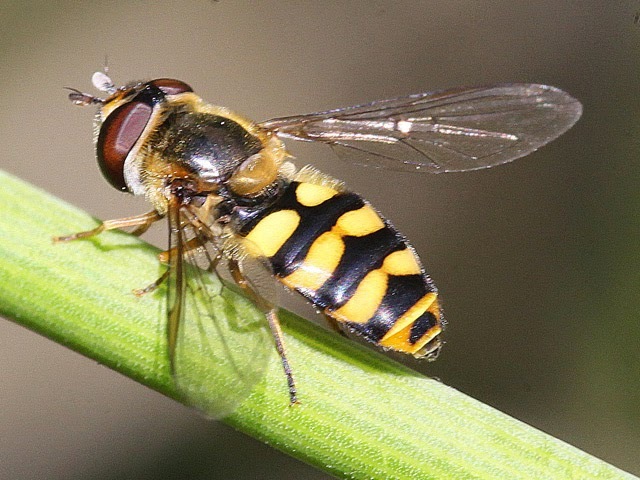 A reminder that the next In Focus field event at the Obs takes place between 10am and 4pm tomorrow, Saturday 30th August. Hunting for grounded migrants was very hard work on a day of dreary skies and unrelenting brisk westerlies - and the evidence from the Obs garden mist-nets, that caught just two new arrivals all morning, suggested it was a bit of a waste of time anyway; a single Redstart, along with a scatter of Yellow Wagtails and Wheatears, constituted the only reward from the Bill area. Fortunately there was just about enough on the move on the sea to make it worth keep watching, with 35 Balearic Shearwaters, 27 Manx Shearwaters, an Arctic Skua and a Common Gull the best of day's totals from the Bill. ...a paler than average individual. Ferrybridge has been consistently well-watched and busy so far this autumn and it again provided some of the best birding on a bright and breezy day, with the first 2 Little Stints of the season and an out-of-habitat Purple Sandpiper being particularly noteworthy; 2 Kittiwakes and a Common Sandpiper were also of interest amongst the wide variety of other waterbirds dropping in there. At the Bill it was again the fields rather than the bushes that came up with the numbers, with the likes of Yellow Wagtail and Wheatear, that returned totals of 40 and 120 respectively, being considerably more conspicuous than any of the warblers (just 3 new birds were trapped and ringed at the Obs all morning); the supporting cast there included 9 Grey Herons, 7 Whinchats, 5 late Swifts and 2 Lesser Whitethroats overhead/on the land and 4 Balearic Shearwaters, a Great Skua and an Arctic Tern through on the sea. Immigrant moth numbers remained at a low ebb although a Scarce Oak Knot-horn Acrobasis tumidana was a decent overnight capture in the Obs moth-traps. A day of long-awaited easterlies that looked initially to be a considerable disappointment ultimately came good with quite an arrival of common migrants, many of which dropped in/passed through as the morning went on, and the almost expected discovery of the autumn's first Wryneck (at Culverwell); other oddities included a Marsh Harrier heading south from Ferrybridge to the Bill and an Osprey at Ferrybridge. The Bill area got the most thorough coverage and returned totals that included 120 Wheatears, 60 Yellow Wagtails, 30 Willow Warblers, 10 each of Tree Pipit and Sedge Warbler, 4 each of Redstart and Whinchat, and singles of Yellow-legged Gull and Spotted Flycatcher on the ground and 400 Swallows and 200 Sand Martins through overhead. A good scatter of a similar range of grounded migrants were reported from all other areas that were checked, whilst the day's waterbird miscellany at Ferrybridge included 5 Shelduck, 3 Redshanks, 2 Teal, 2 Knot and Yellow-legged Gull. Despite seemingly favourable conditions seawatching at the Bill didn't come up with anything better than 2 Arctic Skuas, a Balearic Shearwater and a Teal. 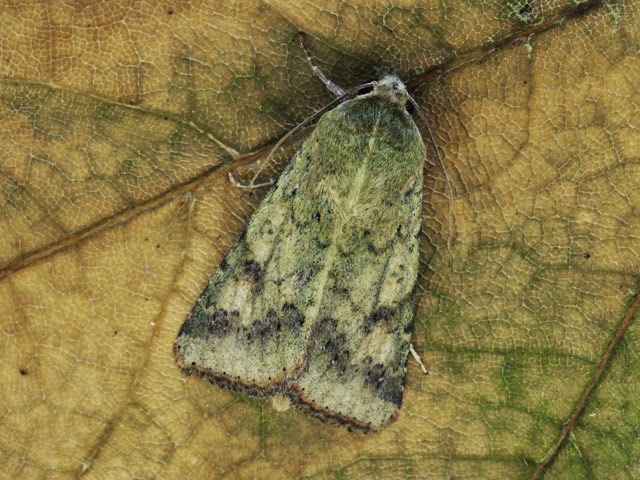 Immigrant moths were again very poorly represented, with singles of Scarce Bordered Straw at Sweethill and Latticed Heath at the Obs providing the only quality. 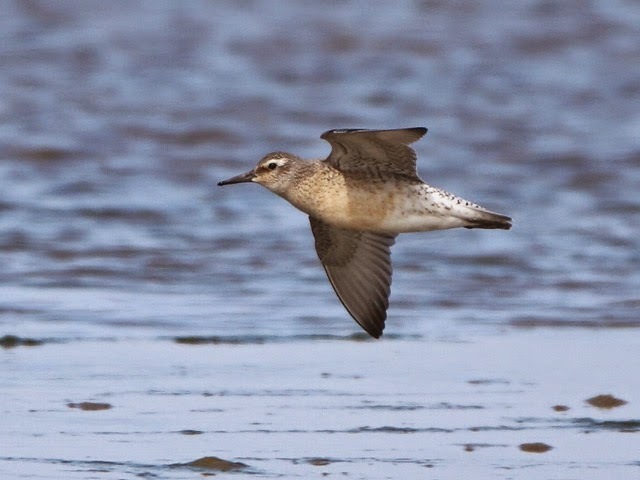 A day not without morsels of interest - notable amongst which were the year's first Wood Sandpiper over the Bill and the autumn's first Osprey over Verne Common - but routine migrants remained sufficiently thinly spread that the ringing total from prolonged effort at the Obs and in the Crown Estate Field didn't even get into double figures. Another dose of overnight rain dropped a scatter a new passerines everywhere - none in the least bit unexpected - and a few additional waders at Ferrybridge, where 8 Knot were of particular note. 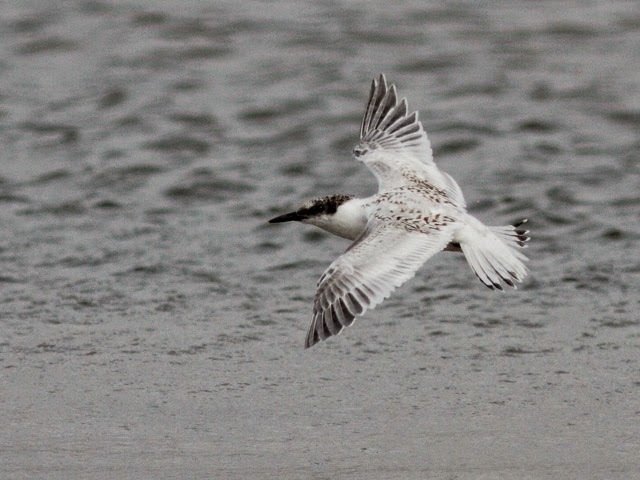 The sea had a feel of interest about it, but in the event nothing more than 22 Common Scoter, 8 Common Terns, 3 Manx Shearwaters, 2 Arctic Skuas and singles of Balearic Shearwater and Great Skua made the log at the Bill. 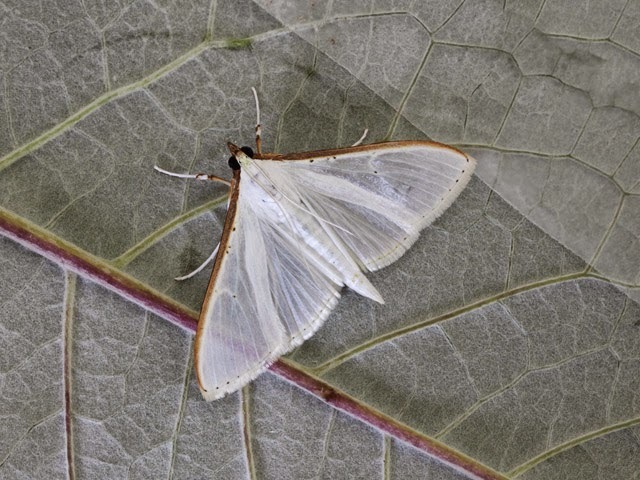 Although there's been a noticeable increase in overnight temperatures in the last couple of nights immigrant interest in the moth-traps consisted of nothing much more than the year's first Olive-tree Pearl Palpita vitrealis at Sweethill. Nobody can complain that today's rain was unexpected, but it more than lived up to its billing with approaching an inch falling overnight and through the daylight hours before the clearance eventually came late in the afternoon. Efforts on the land were always hampered by the conditions but it did look as though, at least by way of passerines, next to nothing new had made landfall. The sea got plenty of attention and after a slow start a limited passage developed off the Bill, where the final totals included 17 Common Scoter, 13 Manx Shearwaters, 11 Balearic Shearwaters, 10 each of Great Skua and commic tern, 4 Whimbrel, 3 Arctic Skuas and singles of Common Gull and Arctic Tern. Hopes of the change in the weather perking up immigrant moth activity were largely dashed, with a Latticed Heath at Sweethill the only noteworthy overnight capture in the traps. We're not at all sure that many birders appreciate quite how uncommon adults of the vast majority of the routine migrants are at migration watchpoints like Portland: put simply, adults are much too clever/experienced to make the mistake of stopping off in the suboptimal habitat of a godforsaken, barren and windswept headland like ours; without a lot of checking back we can't quantify the precise ratio of adults vs first year Redstarts in autumn but the adult male featured above was the first one we can remember handling for several years. 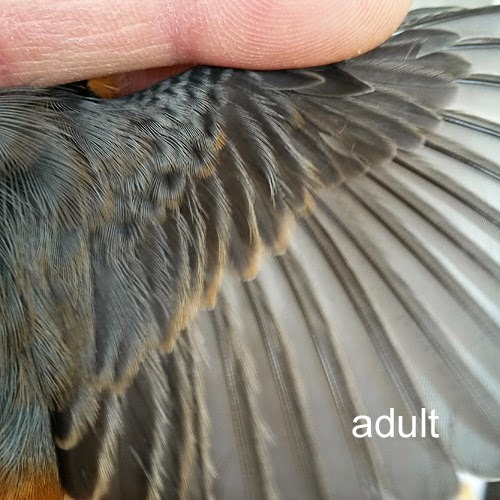 The most obvious pitfall with adults is assuming - wrongly - that the brown tips to the greater and median coverts are an immature feature; these feathers, at least when fresh, are always to some degree brown-tipped, and it's the basal edges of the greater coverts that should be checked - grey in adults, brown in first years. 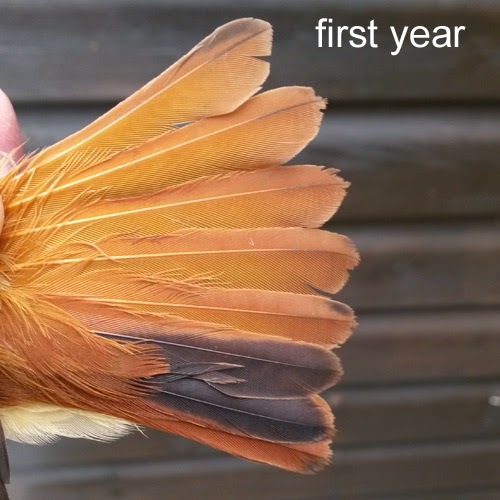 Our first year bird also shows a very typical moult-contrast in the greater coverts: the outer 8 or 9 feathers are juvenile, whereas the innermost 1 or 2 with an adult-type pattern have been replaced prior to migration during the post-juvenile moult. 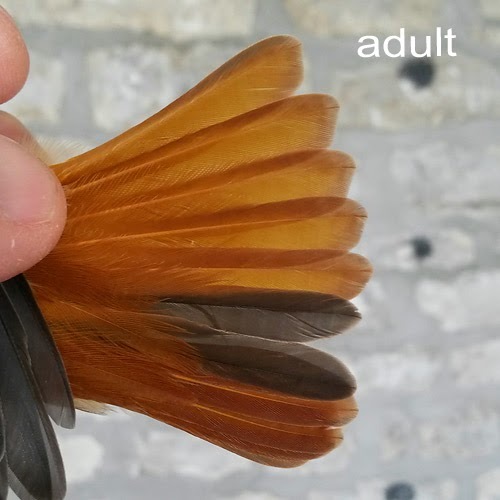 The difference in tail shape between the two age classes (typically, adults have broader, more rounded-tipped feathers than first years) is maybe not so obvious in Redstart as it is in many of our regular migrants, but the two tails above do show rather nicely the much better quality of the adult feathers when compared with the poorer quality - already very worn and chipped at this early stage of migration - of those of the first year. The beginnings of the forecast change in the weather became increasing evident as a veil of cloud rolled in from the west through the day; however, bar a few spots early in the evening, the predicted rain hadn't materialised by dusk. 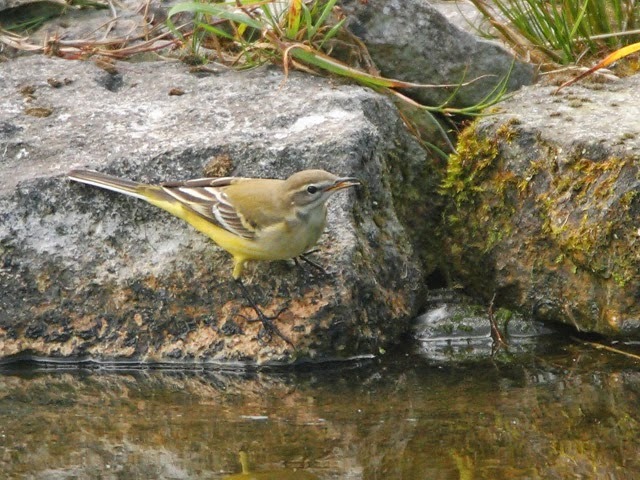 Although there was a scatter of grounded migrants in evidence around the centre and south of the island, including 50 Wheatears, 35 Willow Warblers and singles of Redstart and Grasshopper Warbler at the Bill, it was busier overhead, with a light passage of hirundines, 40 Yellow Wagtails, 14 Swifts and 13 Tree Pipits amongst the assortment over the Bill. 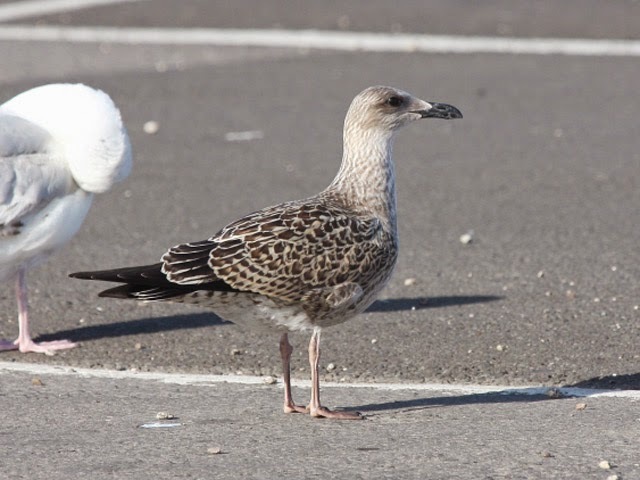 Sea interest has at least temporarily died a death, with a lone Arctic Skua just about the only bird of note off the Bill. With Portland bathed in warm sunshine and escaping the heavy showers that were visible crossing the mainland there were plenty of fieldwork opportunities which contributed little beyond confirming it remained pretty quiet everywhere. 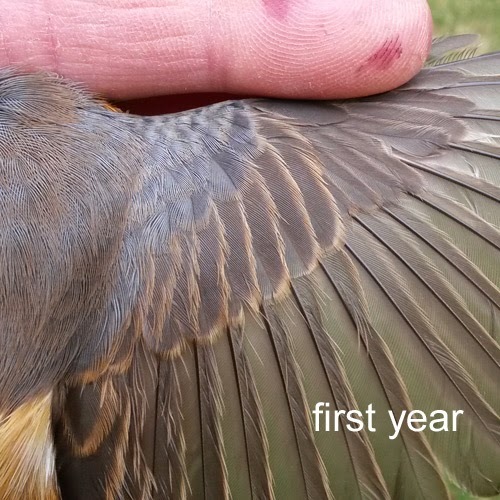 The now standard trio of Yellow Wagtail, Wheatear and Willow Warbler crept into low double figures at the Bill, where there was nothing of further interest beyond 5 Tree Pipits and a Redstart; a late Swift over Cheyne represented the pick of the reports from elsewhere. Numbers remained low in the moth-traps although there was a hint of renewed immigrant interest in the form of singles of Vagrant Piercer, Pearly Underwing and Cosmopolitan at the Obs. With any luck today's dismal showing will represent something of a low point in this autumn's birding...although we're not holding our breath. 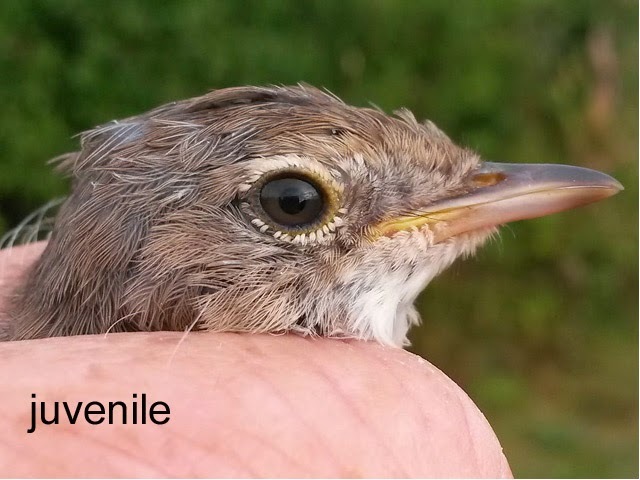 The spectacle of migration in action was certainly underwhelming, with the only migrant mist-netted at the Obs being one of the local Whitethroat youngsters, and singles of Balearic Shearwater and Arctic Skua through on the sea and a lone Grasshopper Warbler on the land being the only even faintly worthwhile reward from the morning's fieldwork in the Bill area. In common with the birding, the less said about recent mothing the better; something of a nadir was reached at the Obs where fewer than 10 individual immigrants made it into the 4 traps we're still running for the first time since 18th July. Although the day itself saw frequent spells of heavy cloud roll through, the hours of darkness had been mainly clear and certainly not very helpful on the migrant front. The expected commoner migrants were all represented, albeit not in any particularly worthwhile quantities bar totals of 172 Ringed Plover at Ferrybridge and 30 Cormorants through over the Bill; 3 Snipe and 2 Grey Wagtails also overhead the Bill were both first records for the autumn, whilst 22 Manx Shearwaters, 8 Balearic Shearwaters and a Great Skua passed by on the sea there. ...Fulmar passage is likely often masked by the comings and goings of the local population but yesterday's grey-headed bird was certainly a non-local. 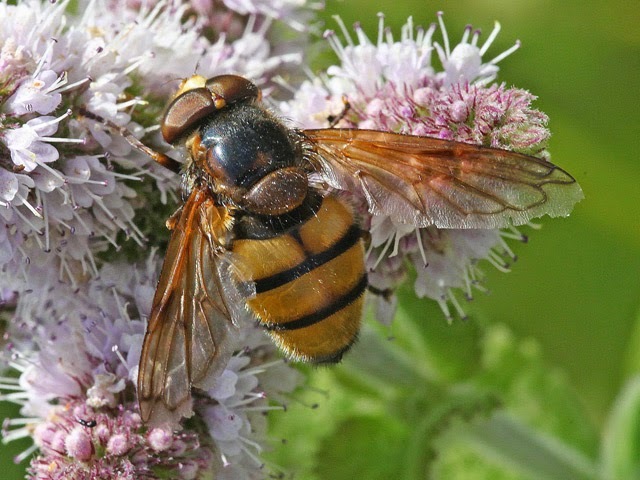 The steady improvement in migrant variety and numbers continued, with today coming up with a fullish tally of late August fare even if not in quantities that might have been described as a fall. Totals from the Bill area included 60 Wheatears, 40 Willow Warblers, 24 Cormorants, 19 Yellow Wagtails and 16 Sedge Warblers, with 4 Common Sandpipers, 4 Redstarts, 2 Lesser Whitethroats and a Grasshopper Warbler of particular note amongst the lesser totals. 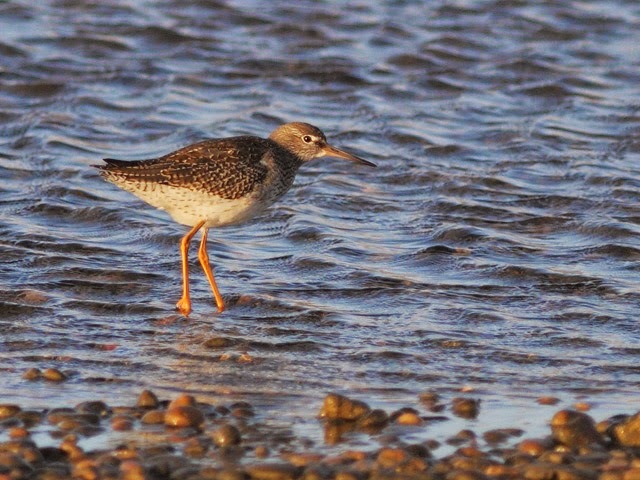 The Ferrybridge miscellany included 3 Common Sandpipers, 2 Little Ringed Plover and 2 southbound Sparrowhawks. What breeze there was remained firmly from an offshore direction, so 5 Balearic Shearwaters were the only worthwhile sea sightings at the Bill. Although there was a good deal of variety today, numbers remained well below par for this stage of the autumn. At the Bill only Wheatear (25), Willow Warbler (20) and Tree Pipit (11) made it into double figures, with a single overflying Golden Plover being the only oddity. 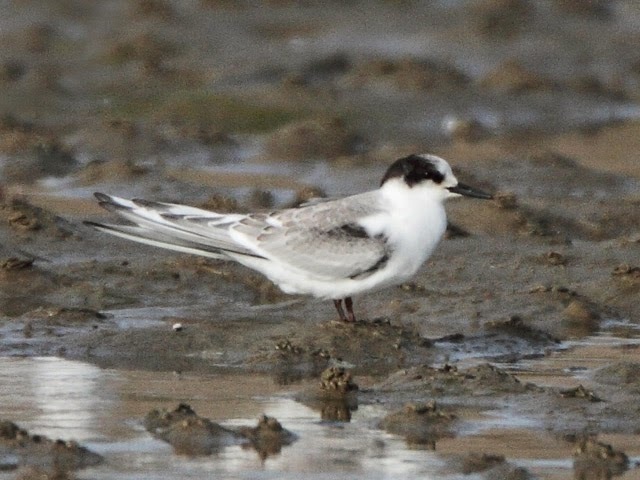 Improved coverage of other island areas was particularly welcome and, amongst a similar spread of routine fare, came up with noteworthy sightings in the form of the long-staying Hooded Crow at Admiralty Quarry, a Little Ringed Plover and a Pied Flycatcher at Wakeham/Bumpers Lane and 3 Yellow-legged Gulls and a Knot at Ferrybridge. Odds and ends through on the sea at the Bill included 49 Manx Shearwaters, 3 Balearic Shearwaters and a lone Great Skua. 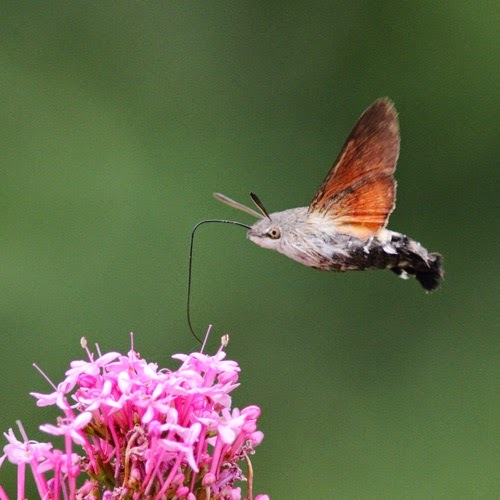 Hummingbird Hawk-moths continued to increase, with it likely that 100 or more were present on the island today. A party of c35 small cetaceans, most likely Common Dolphins, headed west off the Bill during the afternoon. 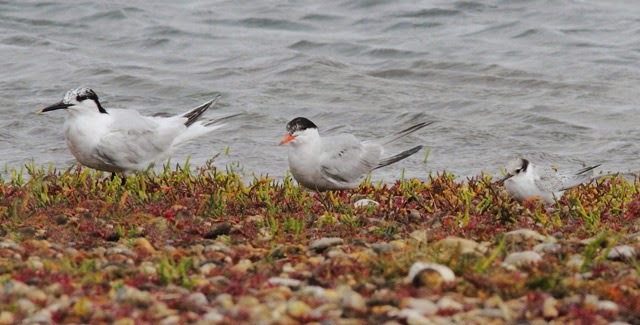 ...these two colour-ringed/flagged birds were both at Ferrybridge in recent days. 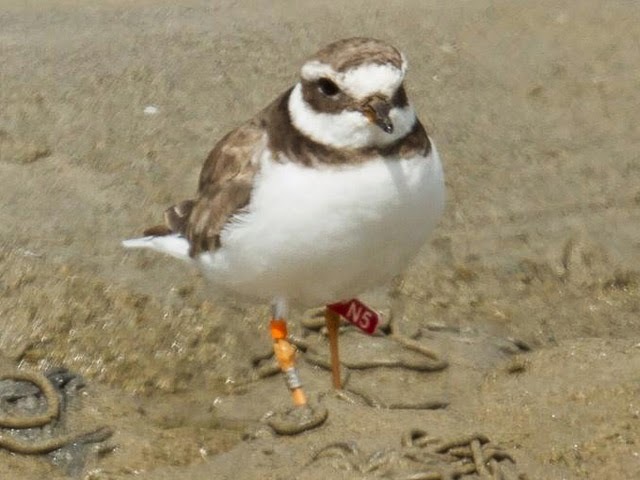 The Ringed Plover was first marked as a chick near Malmö in southern Sweden on 15th May 2013; it was also present in the same area during this summer's breeding season. 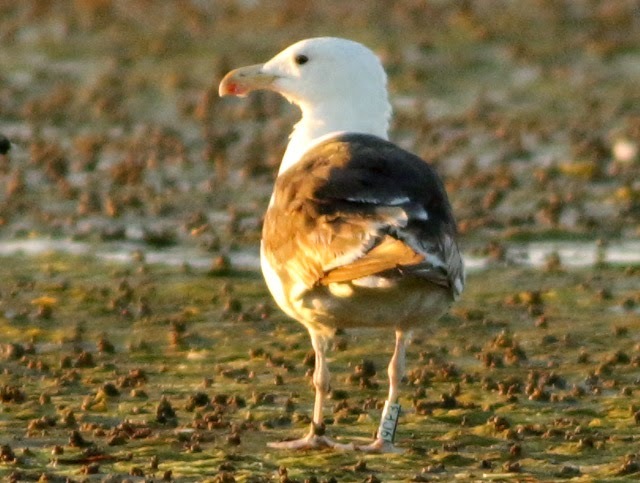 The Great Black-backed Gull was first marked as a chick on Sark, Channel Isles, on 19th June 2011; it was subsequently sighted on nearby Guernsey in February and March 2012, and again in January and September 2013. Thanks to Peter Olsson and Paul Veron for replying so promptly with these details. With a brisk north-westerly breeze still well established conditions were far from what we'd like to see at this time year; the day's only redeeming feature was the bright, sunny sky that at least made fieldwork more enjoyable than yesterday. There was a slight upturn in migrant variety at the Bill, where 25 Willow Warblers and 20 Wheatears made up the bulk of the numbers and 4 Tree Pipits and singles of Whinchat, Redstart, Grasshopper Warbler and Spotted Flycatcher provided a bit of interest; the first presumed migrant Blackcap of the autumn also showed up at Southwell. 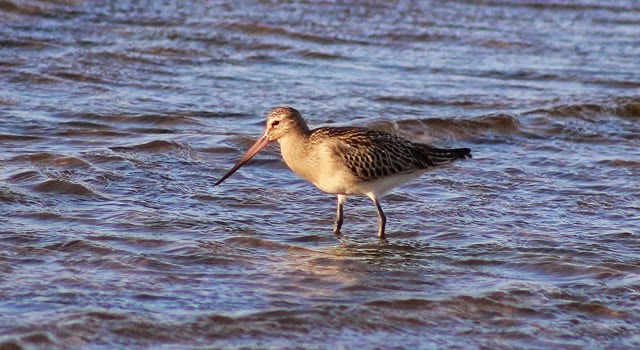 Variety and numbers changed little at Ferrybridge, where a lone Black-tailed Godwit was the pick of the oddities. 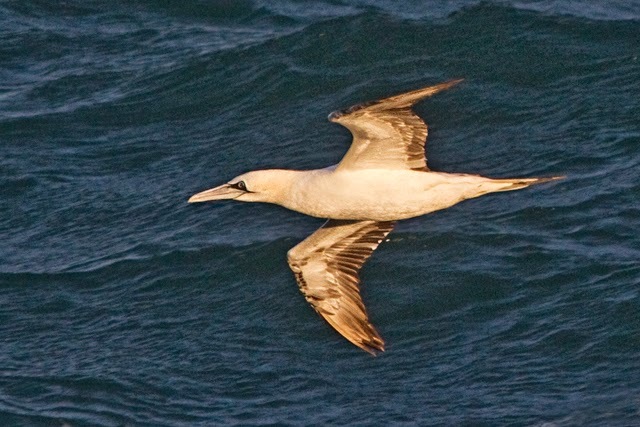 At sea a feeding flock of up to 300 Gannets off the Bill - presumably attracted by shoaling mackerel - was of particular note, whilst 88 Manx Shearwaters and an Arctic Skua also passed by. Heros to zeros in quick time today, with not a sniff of a repeat of yesterday's excitement. In truth, just about anything could have been lurking at the Bill but the chances of finding it in the cool, overcast and very windy conditions were slim indeed; in the event, Wheatear just got into double figures but singles of Tree Pipit, Sedge Warbler, Garden Warbler and Willow Warbler were the only other grounded migrants logged. 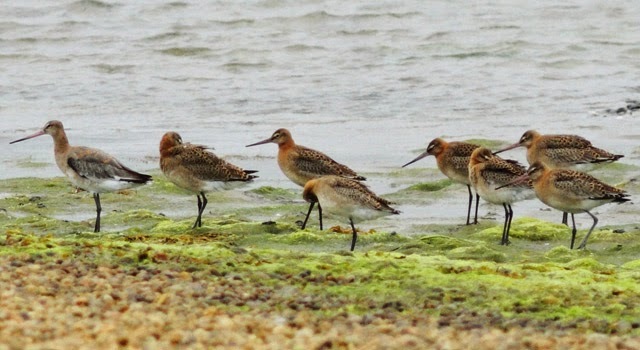 Another 9 Black-tailed Godwits dropped in at Ferrybridge - or are the recent records there just regular wanderers from Lodmoor/Radipole? 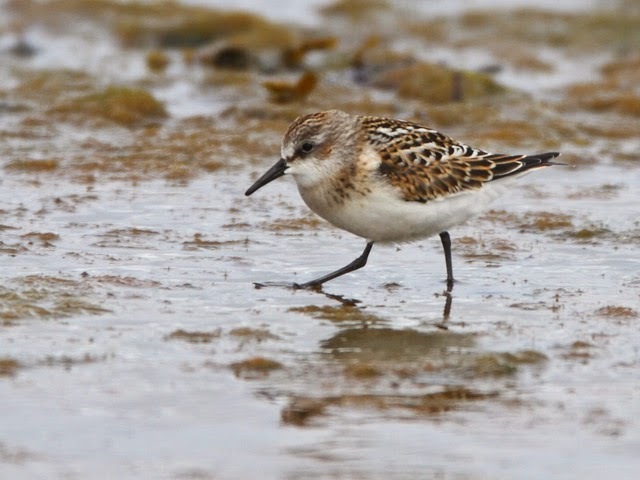 - where 3 Sanderling and singles of Redshank, Bar-tailed Godwit, Whimbrel and Arctic Tern were amongst the continuing decent numbers of Ringed Plovers, Dunlin and Common Terns. Seawatching at the Bill came up with a surprise in the form of a long-range Sabine's Gull, with 22 Manx Shearwaters, 16 Balearic Shearwaters, 13 Common Scoter and a Great Skua making up the back-up tally. 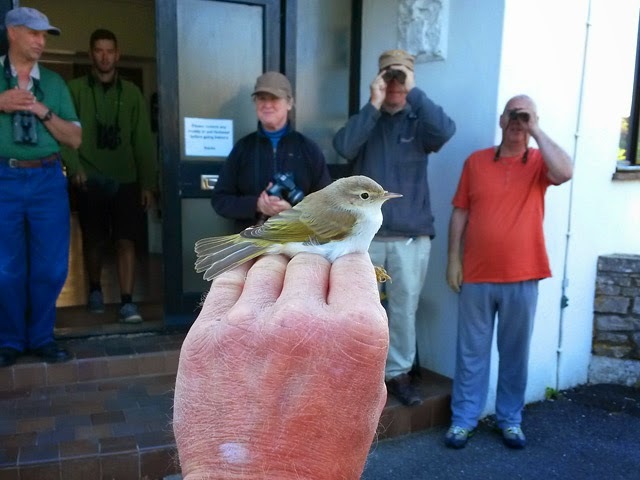 We're sure that we've said it before, but some rarity records really do defy ready explanation so we'll just dine out on the fact that a Western Bonelli's Warbler graced the Obs garden today - the first record there for 38 years - rather than dwell on why it should have turned up on a north-westerly after a week of wholly unpromising Atlantic weather; although enjoyed by those who were on hand to see it at close quarters after it had turned up in a mist-net, it proved far from easy to catch up with after release and remained extremely elusive for the rest of the day. The rest of the day's events paled by comparison, with grounded migrants a less than conspicuous feature after a very clear night. The Bill area did come up with a fair bit of visible passage, including 26 Cormorants heading in various directions, 11 Tree Pipits, 3 tardy Swifts and several hundred more departing Lesser Black-backed Gulls, but singles of Lesser Whitethroat, Pied Flycatcher and Spotted Flycatcher amongst a handful of Sedge Warblers and Willow Warblers provided the only real interest on the ground; elsewhere a Little Egret passed over at Blacknor. Seawatching at the Bill came up with 33 Common Scoter, 16 Manx Shearwaters, 2 Sanderling and a Tufted Duck. The Obs moth-traps were a little busier than might have been expected on a cool, clear night, but singles of Vagrant Piercer and Delicate provided the best of the immigrant interest. 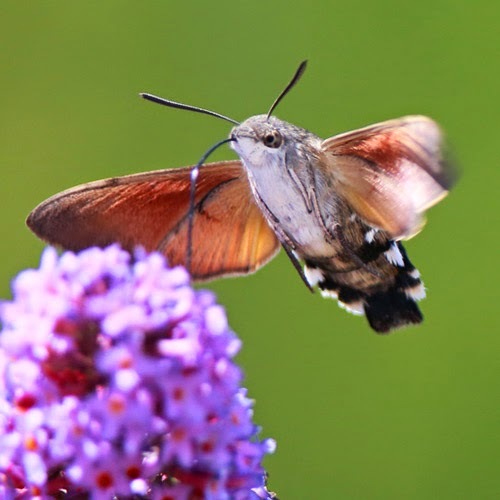 By day, Hummingbird Hawk-moths and Painted Ladies were both more conspicuous than in recent days, with several of both in the Obs garden and at other sites around the island. 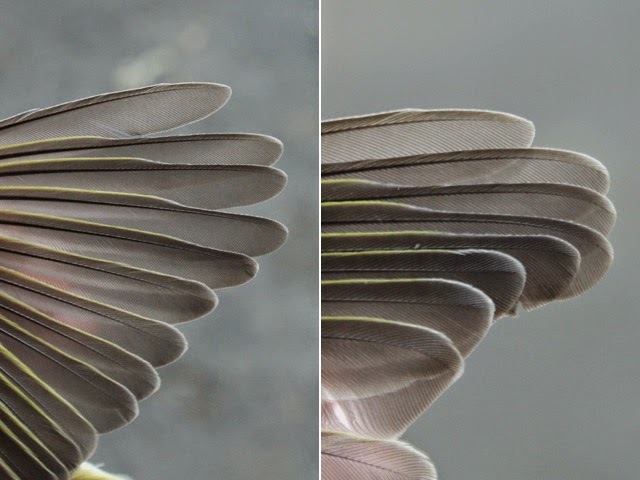 ...with the bonelli's warbler species-pair these days considered almost inseparable on plumage features alone it was perhaps fortuitous that this individual should be first found in a mist-net and straight away reveal itself to possess a wing-formula seemingly typical of Western: the tip of the 2nd primary (the uppermost feather in the photos below) fell between the tips of the 6th and 7th (longer in Eastern, usually falling between the 5th and 6th), and the 6th primary was clearly emarginated (less clear/absent in Eastern). 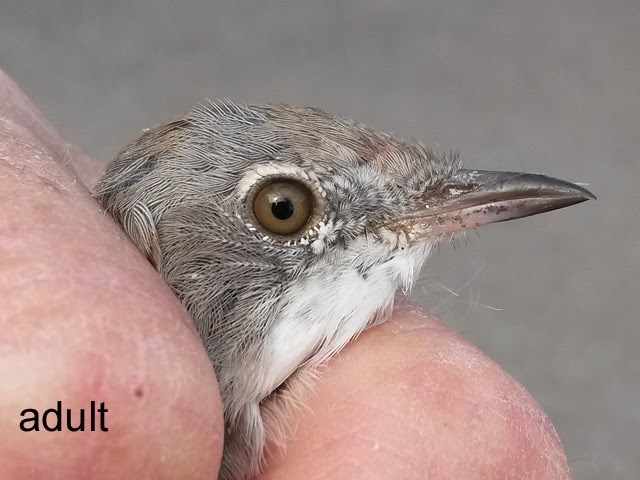 Eventually the bird was heard to call on several occasions - a disyllabic note (vaguely Willow Warbler-like on our one hearing at some distance) quite unlike the chipping call of Eastern. In altogether quieter and more pleasant conditions there were hints of passage picking up a little. A Marsh Harrier over Blacknor constituted the day's only untoward sighting; among the commoner migrants, the Bill area returned totals that included 35 Wheatears, 30 Willow Warblers, 20 Whitethroats, 10 Robins, 10 Sedge Warblers, 5 Tree Pipits, 2 Ringed Plover and singles of Grasshopper Warbler, Garden Warbler and Spotted Flycatcher, together with a trickle of Sand Martins and Swallows overhead, whilst 209 Ringed Plover, 200 Common Terns, 95 Dunlin, 4 Sanderling and singles of Redshank, Greenshank, Bar-tailed Godwit, Whimbrel, Arctic Tern and Little Tern were at Ferrybridge. 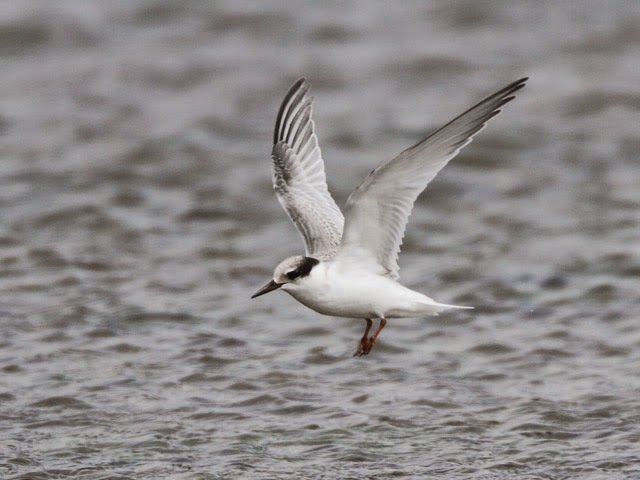 In an offshore breeze sea interest dwindled, with no more than 7 Manx Shearwaters, 6 Common Scoter, 3 Sandwich Terns and singles of Arctic Skua, Great Skua and Yellow-legged Gull through off the Bill and a lone Common Scoter settled in Chesil Cove. Overnight moth-trapping was not at all busy, although Portland's fifth Jersey Mocha was a nice highlight at Sweethill. 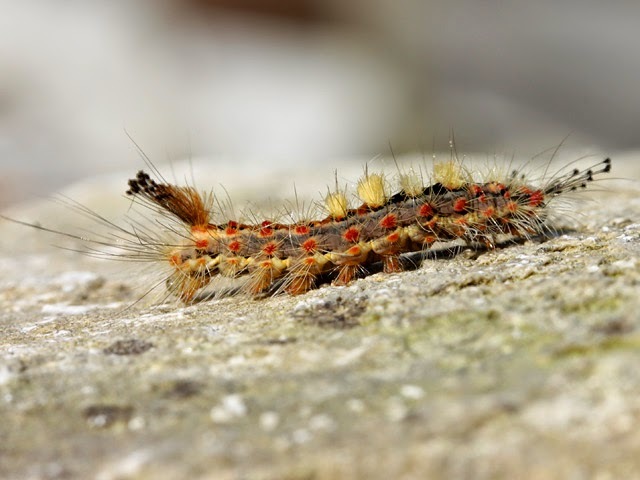 Although the more or less constant threat of showery rain came to nothing there was nonetheless nothing to commend the conditions, with the brisk north-westerlies that look to be getting established being just about as hopeless as it gets at this time of year. Today's few new arrivals at the Bill barely deserve a mention, with 5 Tree Pipits and singles of Ringed Plover, Yellow Wagtail and Redstart providing the only interest amongst the handful of Wheatears and Willow Warblers; 21 Oystercatchers and 5 Knot were of note amongst the continuing decent variety of waders and terns at Ferrybridge. The only reports from the sea were of 20 Common Scoter, 5 Manx Shearwaters and 2 Balearic Shearwaters through off the Bill. 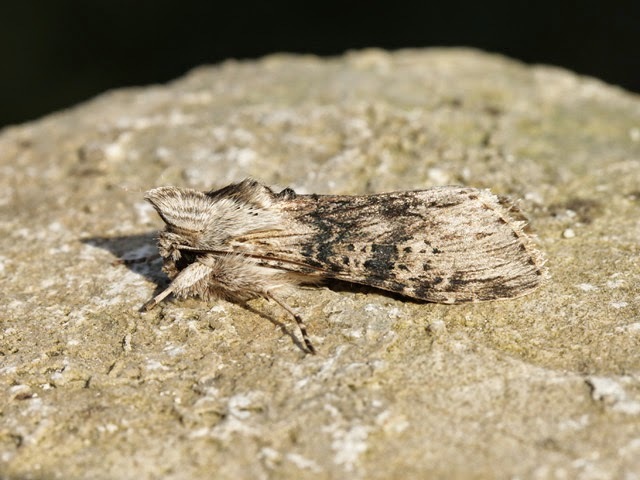 The prevailing conditions are as poor for overnight mothing as they are for daytime birding, with singles of Pearly Underwing and Dog's Tooth providing the only interest amongst the handful of immigrants at the Obs. 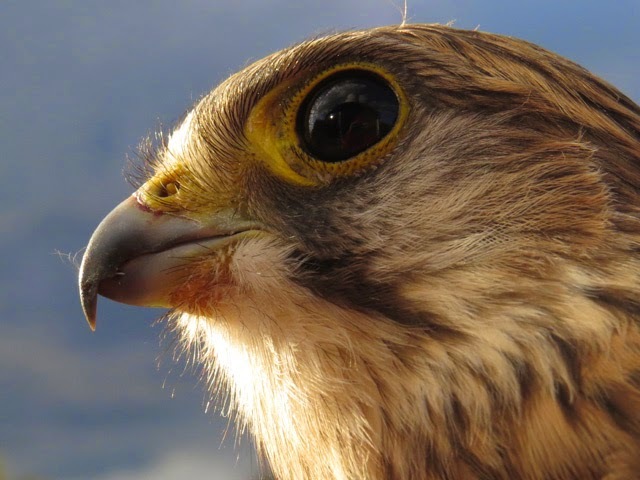 Although there were hints that the weather's beginning to settle down again it was still much too breezy and clear overnight to have expected much of an arrival of grounded migrants - and that's certainly how events panned out. At the Bill 2 Ringed Plover and singles of Yellow-legged Gull, Yellow Wagtail, Grasshopper Warbler and Reed Warbler provided minor interest amongst the just into double figure numbers of Wheatear and Willow Warbler; a Tree Pipit was also new at Bumpers Lane, whilst increases at Ferrybridge saw totals of 160 Ringed Plover, 153 Dunlin and 11 Sanderling make the log. 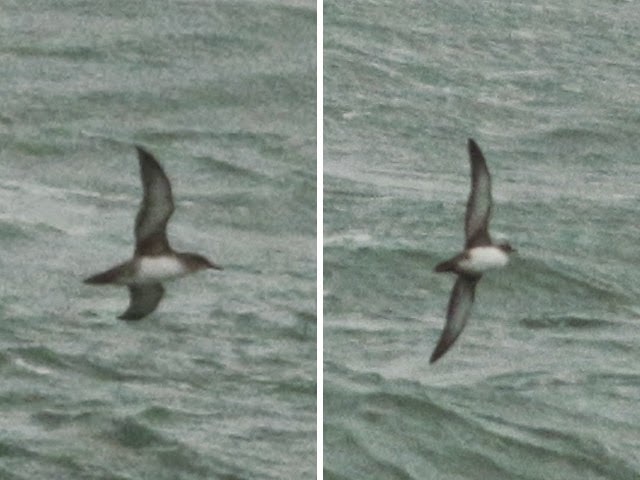 The sea still got a lot of attention although rewards were scant: 2 Arctic Skuas lingered off Chesil Cove, whilst 13 Manx Shearwaters and 5 Balearic Shearwaters passed through off the Bill. Two Vagrant Piercer at the Obs were the first decent immigrant moths to make it into the traps for several nights. By day, Hummingbird Hawk-moths and, to a lesser extent, Clouded Yellow butterflies are being recorded in small numbers throughout the island at the moment. 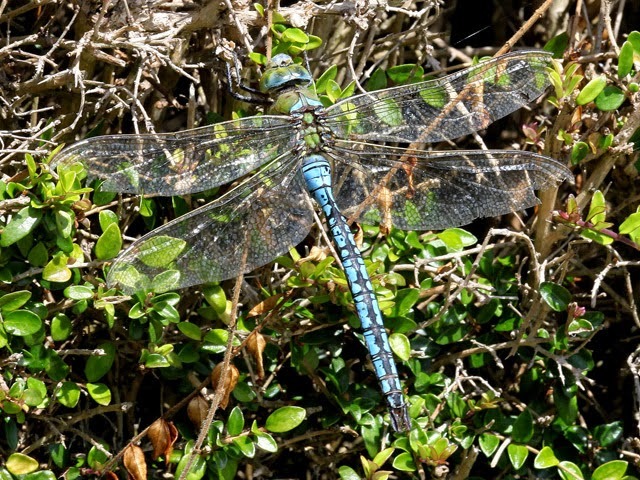 ...after a lean couple of decades when we encountered this species very infrequently, it seems to be on the up once again with relatively frequent records, particularly from the garden traps at the Obs and the Grove; as far as we know, with the exception of one or two inland strays, Portland remains its only Dorset outpost. The sea continued to receive the lion's share of attention, for the most part only because the unrelenting wind prevented much serious fieldwork on the land. Watches at the Bill during the morning were startlingly unproductive, with little more than 45 Fulmars, 4 Common Scoter, a Manx Shearwater and a Whimbrel through, but movement picked up during the evening when 80 Manx Shearwaters and the autumn's fourth Cory's Shearwater passed by during the last hour of daylight. 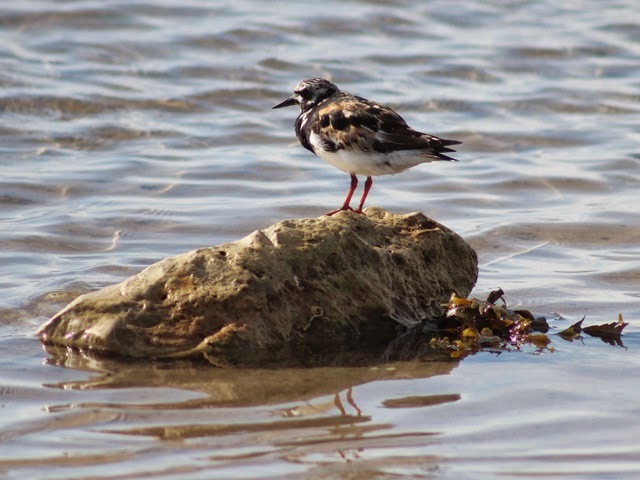 Ferrybridge came up with all the numbers on the land, including 250 Common Terns, 100 each of Ringed Plover and Dunlin, 12 Oystercatchers, 4 Sanderling, 2 Little Terns and a Redshank; the Bill couldn't muster more than 11 Wheatears, 3 Willow Warblers and singles of Ringed Plover and Turnstone. With the wind having not died away to the extent that we'd anticipated/hoped today was another day of more or less constant seawatching. With the exception of a Cory's Shearwater reported by a visitor at the Bill the rewards were thin indeed, with further watches there coming up with no more than 6 Manx Shearwaters, 3 Common Scoter, 2 Whimbrel and singles of Balearic Shearwater and Pomarine Skua. 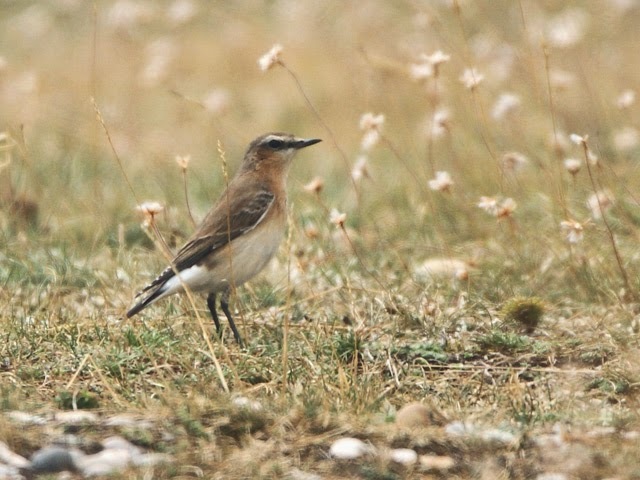 Also at the Bill, southbound Lesser Black-backed Gulls were again departing in quantity, a lone Ringed Plover was new on the ground but passerines of note consisted of nothing more than a handful of Wheatears and Willow Warblers. 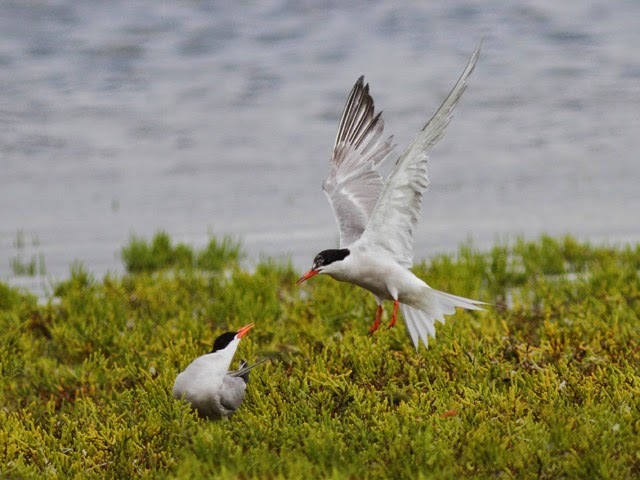 The day's only other reports came from Ferrybridge, where 160 Common Terns, 5 Sanderling, a Redshank and a Little Tern were of note. Finally, check out our Notices page where we've just posted details of some really quite nice optical equipment for sale. Why is it that the mere mention of the word gale brings a headlong rush of normally rational birders to the Bill in expectation of it being something akin to a poor man's Pendeen? Perhaps our memory is defective, but has the Bill actually got any heritage of good seawatches in a raging gale? 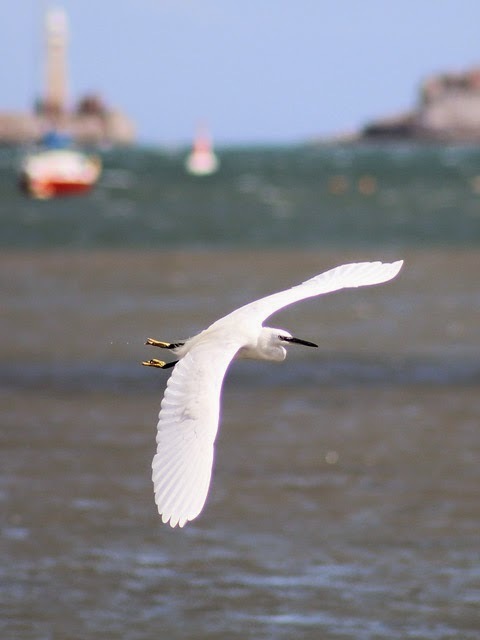 Today's dreg ends of Hurricane Bertha brought with it a good overnight soaking and some unseasonably high seas and strong winds, but bird-wise it was as dead a loss as so many of its predecessors. Prolonged coverage at the Bill came up with nothing more than 35 Manx Shearwaters, 24 Common Scoter, 14 Balearic Shearwaters and singles of Arctic Skua and Great Skua; additionally, a steady southbound passage of Lesser Black-backed Gulls was underway all day, with two sample hour-long counts during the apparent peak of the movement in the afternoon and evening that came up with a total of just shy of 150 indicating that the day-total would have been well in excess of 500. 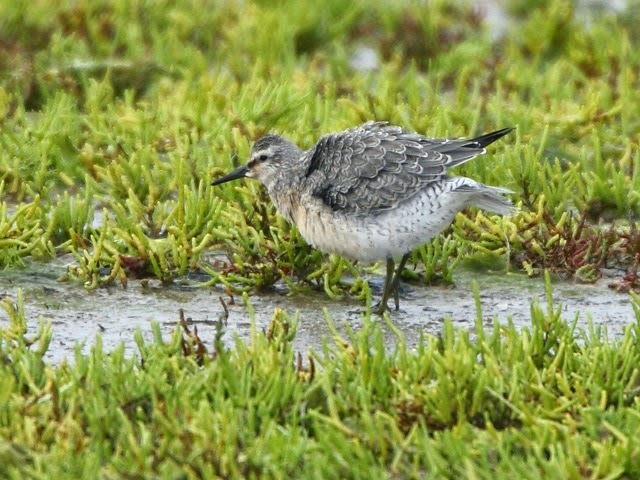 Grounded migrants were hard to get to grips with at the Bill but did include 2 Sanderling and a Whimbrel. 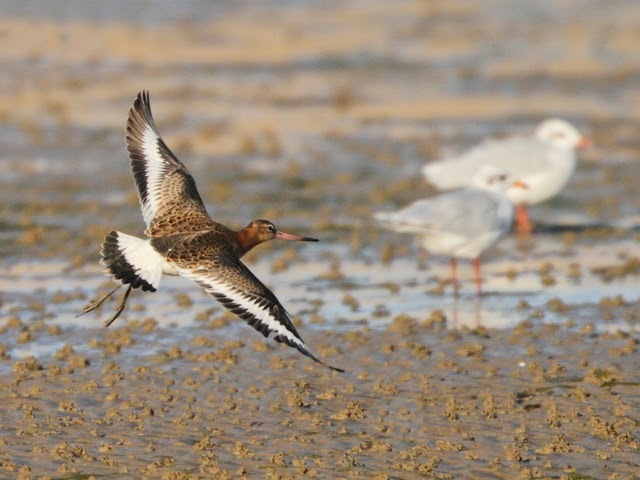 Ferrybridge is a site that rarely disappoints in stormy weather, and today it returned totals of 136 Common Terns, 16 Black-tailed Godwits, 6 Whimbrel, 3 Bar-tailed Godwits, 2 Sanderling and a Redshank. In a briskish wind and under mainly clear skies interest was relatively hard to come by today. Singles of White Wagtail and Redstart were the pick of the passerines at the Bill, where evidence suggested a fair few of the limited numbers of commoner fare on offer were lingers from recent days. 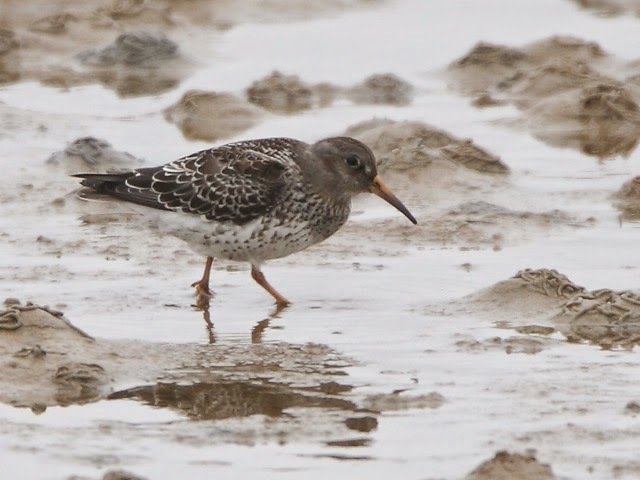 New arrivals at Ferrybridge included singles of Golden Plover, Redshank and Common Sandpiper. 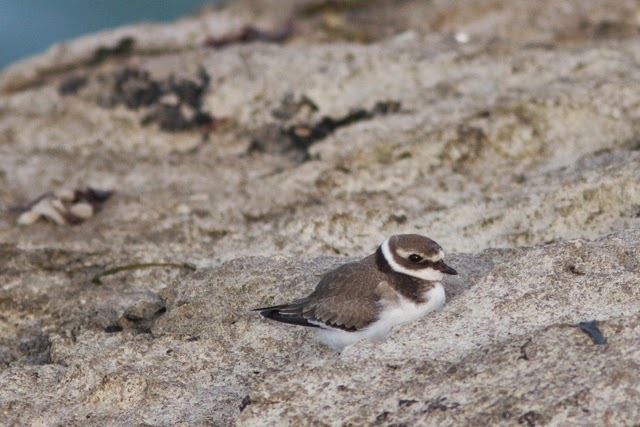 The heightened interest in the sea ahead of tomorrow's depression came up with little more than 2 Balearic Shearwaters, 2 Arctic Skuas and a trickle of Manx Shearwaters through off the Bill. 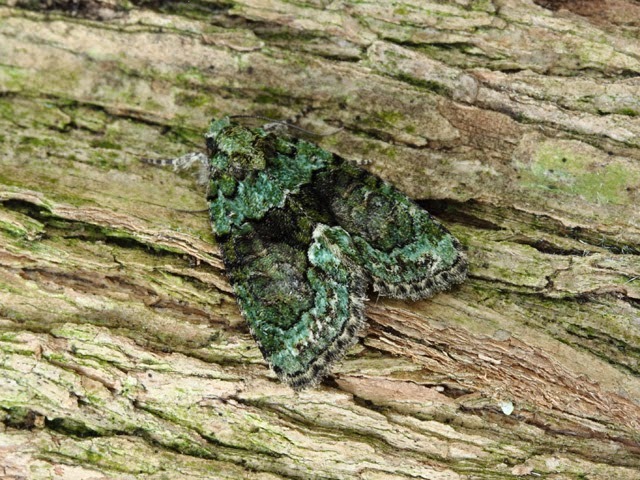 In comparison with recent weeks, overnight moth activity was very subdued, although a Tree-lichen Beauty at Sweethill was a notable highlight amongst otherwise paltry numbers of immigrants.